Two Streets and a School » James Betelle, Where Are You? 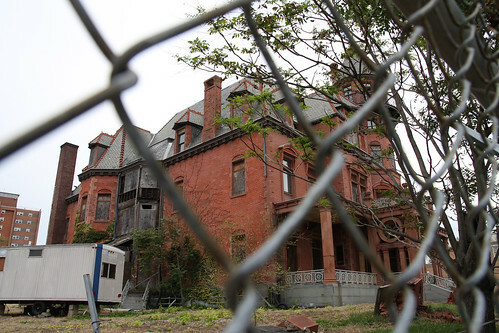 Newark wears its history in plain sight. An astoundingly diverse collection of buildings, evocative street names and a rich narrative dating back over 300 years lay the city bare to those who even casually glance. James Betelle spent his 20 most productive years there, so it naturally comprises a good chunk of my research. 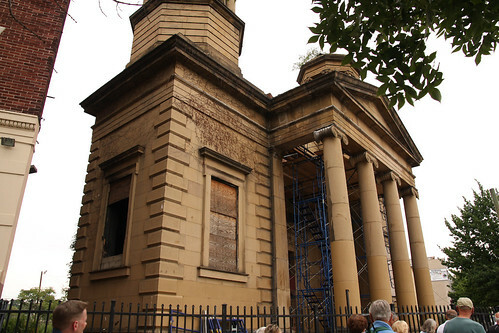 I’ve spent more time in Newark than any other town or city connected with Betelle, and I look for any opportunity to see it anew. 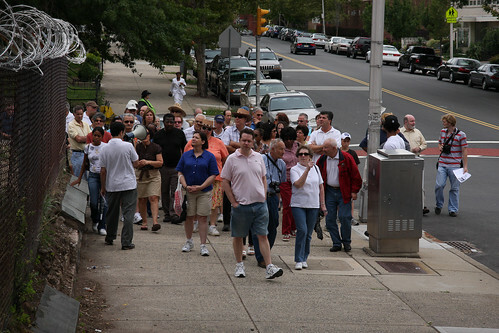 So when I recently had the chance to attend not one, but two Newark architectural tours, I made all sorts of arrangements and deals with my wife to make it happen. 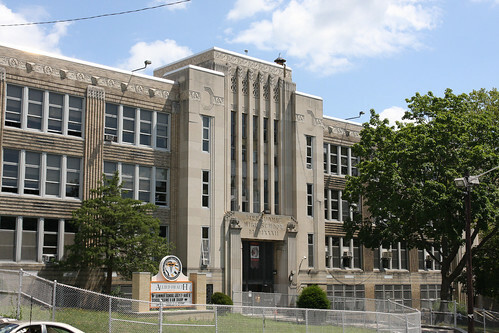 On Friday I would be visiting Weequahic High School, a late design by Guilbert & Betelle, and Sunday taking a tour of High Street and lower Broad Street. On both days I would be meeting in person some of the “Newarkologists”—historians, residents, aficionados—with whom I’ve had spirited email exchanges with over the last few years. Friday afternoon I met up with architectural historian Glen Leiner on the steps of Weequahic High School. He was leading a private “nostalgia” tour for an alumna’s family, and was kind enough to let me tag along. We joined Phil Yourish, head of the Weequahic Alumni Association, who led us through the school. 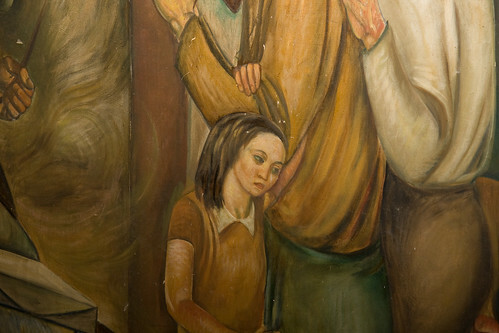 Weequahic recently turned 75, and Leiner, along with the WHA, are looking to restore its prized possession, a mural that adorns the school’s front hall. History of the Enlightenment of Man was painted by WPA artist Michael Lenson in 1937, and is a wonderful example of 1930s deco style. The painting wraps around the walls of the marble-clad lobby, and is quite striking when you come upon it. I was surprised at its relatively good condition, considering spending nearly 75 years inhaling the sweaty aura of teeming high school students. Credit for the preservation is likely because the main entrance isn’t actually used much; students normally use a pair of smaller entrances on either end of the school. 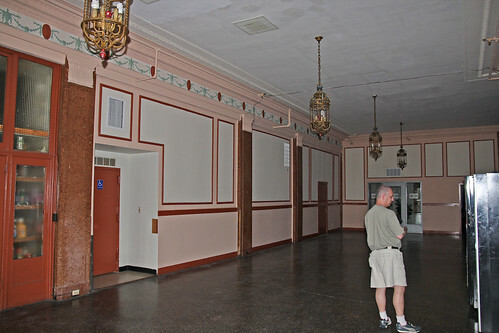 The lobby is a tall, narrow space with typically Deco stepped moldings and clean lines. 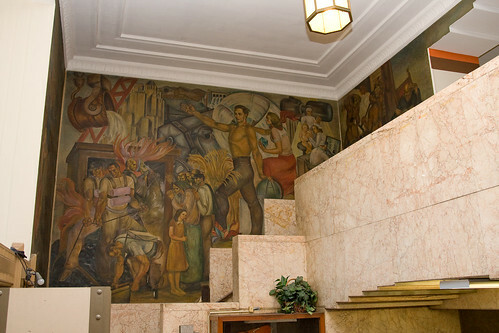 The stairs leading up take you past the narrative of the mural into the main hall of the school, the central steps lead down to the secondary auditorium lobby. Given the style and financial restraints of the early 1930s, it’s no surprise Weequahic’s most elaborate features are concentrated to the front entrance. The rest of the school is somewhat institutional, but a few nice touches do reveal themselves, such as the Art Deco glazed tile wainscoting in the hallways, and arched water fountain alcoves. The hallway outside the auditorium continues the pink marble of the lobby, with a floor of herringbone terrazzo. On the wall is a wonderfully Deco dedication plaque. At the bottom it names, as always pleases me, Guilbert & Betelle – Architects. 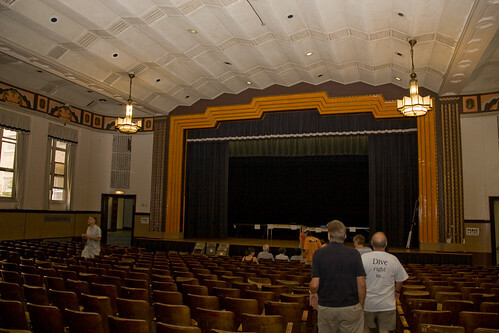 The auditorium is trimmed in the school colors of orange and black, which I don’t imagine is the original color scheme. Relief panels of vessels overflowing with flowers and water line the top of the walls, and the ceiling is an arched corrugation of off-white panels. The whole effect mirrors the slightly Egyptian-themed geometry of the main facade. The seats, amazingly, are the originals from 1932. Some are in rough shape, but otherwise they still do their job commendably. I recall the same type of seats at my schools before they were renovated, it was a bit nostalgic to sit in them again. Nostalgia was the theme of the tour, but the mission to restore the murals and keep Weequahic alive and vibrant are certainly forward-thinking. Thanks again to Leiner and Yourish for showing me around, it was well worth the wait. Sunday afternoon, with the threat of a downpour looming, I, along with almost 40 kindreds, met in front of Arts High School for a tour of High Street (MLK Blvd.) and lower Broad Street. 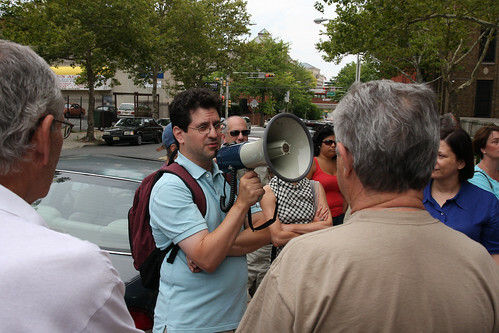 The tour was led by Jeff Bennett of Newarkology, a guy who shares his passion for the city with a casual élan. Wrapped up as I am in the minutia of a single architect, it’s easy to lose the bigger picture. So it was with great anticipation I joined the tour, in the hopes of learning a bit more about Newark outside of my singular interest. I was glad we started at Arts, as Jeff graciously handed me the bullhorn to spend a few minutes telling the group a bit about Guilbert & Betelle, the school and other little factoids that rattled around my brain. After I finished, I spoke with a few people on deeper details, and did indeed meet some of those folks whom I’d been emailing with for so long (thanks for the photos, Brian!) Many of us chatted along the route, picking on topics as varied as the city we were exploring. That was definitely a highlight of the day. The main attraction of High Street was certainly the Krueger-Scott Mansion, a stern yet oddly-whimsical pile of Victorian brick and sculpture. Built by in 1889 by German brewer Gottfried Krueger, this amazing semi-ruin encapsulates Newark’s past and present in one weedy corner lot. It’s a much beloved house that has had a rough history. Recent work has helped preserve it a bit, but it’s future is uncertain. We spent a few minutes at the mansion, which was good, as the building takes on wonderful different silhouettes as you walk around it. When one person asked what style the building is, Bennet’s witty reply was, “Beer Baron Baroque.” It’s probably sacrilege to say this, but I find the current state of the Krueger-Scott Mansion more compelling than had it been a fully restored gem, but then I’m a sucker for crumbly ruins. Further down High Street was the historic Temple B’nai Jeshurun, now Hopewell Baptist Church, and the Hotel Riviera. We didn’t enter the church as a service was in progress, but the hotel was open to take a look. Back in the day the Riviera was a relatively swank hotel, but now serves as an SRO. The interior isn’t spectacular by any means, but has some nice terrazzo and mosaic floors. The space was large and empty, lending an Overlook Hotel vibe. Needless to say I didn’t spend much time in there. Lincoln Park led to the final leg of the tour, straight down Broad and back up to High Street. Broad has a number of interesting older buildings, but much of it has given way to modern construction. 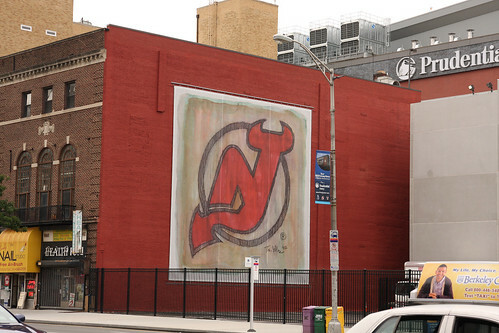 One recent standout is the Prudential Center, the new home of the New Jersey Devils. The tour began at a Guilbert & Betelle building, and ended at one as well; the Essex County Hall of Records. The firm designed this massive classical civic building in 1927 directly behind the Essex County Court House, which recently underwent a massive restoration. This year the Hall received a handsome renovation to its grounds, complementing the work done at the Courthouse. In fact, the whole MLK Blvd. area has new construction and general sprucing up up that is very hopeful for the future. I met some great people over the two hours of the walk, all who shared a passion for architecture, Newark and its history. I look forward to the next tour.